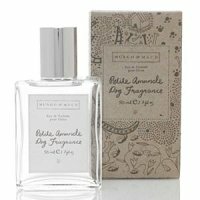 Mungo & Maud dog fragrance inspired by nature with notes of French blackcurrant, Tunisian neroli, mimosa and violet leaf on a base of sweet vanilla bourbon... with a little almond. All ingredients have been carefully chosen and are of the highest quality. For humans too. Spray lightly onto coat. I guess if you're one of those people who carry your dog around in your purse this kind of product makes sense. I just can't see buying chic-chic stuff to put on my 25 lb rescued mutt! Although, as I've said before, she does sometimes get to wear my not so favorite minis after her bath. I'm telling you, the Revolution will not be televised! The company that develops a fragrance to neutralise the scent of a skunk will make a fortune. Have no dog, so don't need to worry about it. The notes don't sound bad though! Joe, that ain't what Apple says! LOL at “already smelling like dogs” — that stuck me as very funny! Yes, my dog stinks, but the problem is his breath, so unless I pour this down his throat (not recommended), it ain't gonna help. Although I don't think this is intended so much for aging black labs as it is for tiny lapdog types.